Seattle's Best Coffee Cup. Size Tall (12 oz). Just like what you see in their stores, these cups are the highest quality and are enhancing the coffee experience in workplaces. 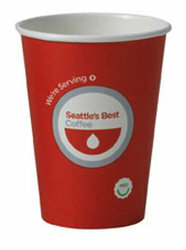 Perfect to complete the Seattle's Best Coffee program and excite your employees. A Quality Cup of Coffee begins with "A Quality Cup"